After a brief break for the winter holidays, we have regrouped in Japan for the second term of our 2013-14 school year. Over the weekend our students had the opportunity to settle in to their new surroundings and begin exploring Hiroshima, the city which will serve as their home over the upcoming months, by participating in a scavenger hunt. New cities are enthralling but often times confusing; luckily for us, students from this term’s host school, Hiroshima International School (HIS), volunteered to help and were there to lead the way. 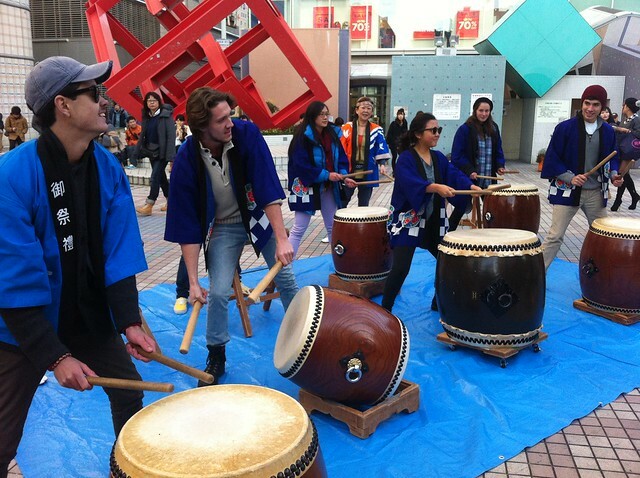 The scavenger hunt concluded with a bang or, to be more precise, the rhythmic banging of traditional Taiko drums. You can find more photos like the one below on our Flickr page. This morning, students, staff and faculty from both schools gathered in the HIS gymnasium for the first assembly of the new term. Cheery in tone, the assembly provided a platform for representatives from each school to introduce themselves and express their hopes and goals for the interschool collaboration. Speakers at the assembly included HIS Head of School Mark Exton, two HIS student representatives, TGS student council president Hannah C., and TGS Head of School Alun Cooper. Our students expressed a high level of anticipation heading into Japan, and so far those expectations seem to have been met. Video from the assembly can be found below, and we look forward to sharing an overview of our Japan term in the near future.